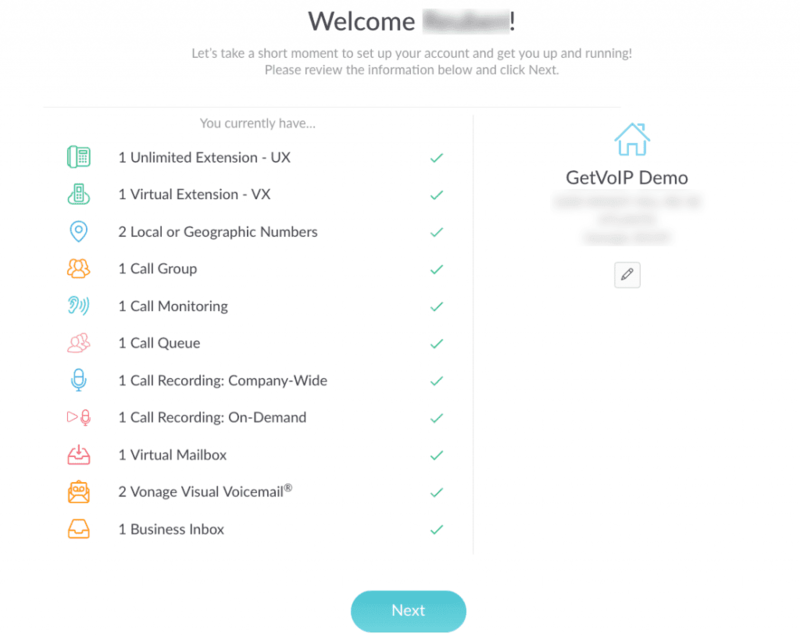 Getting started with a Business VoIP service is easier than its ever been. Between working directly with a sales rep, finding the right solution that fits the specific needs of your business, and configuring the entire system, everything can be done from the comfort of your own home in a few clicks. In the spirit of keeping everything simple, Vonage Business offers a great introduction and setup guide to help new users get started with their service. But at the same time, there’s a lot more to uncover that makes your new Vonage solution so powerful. 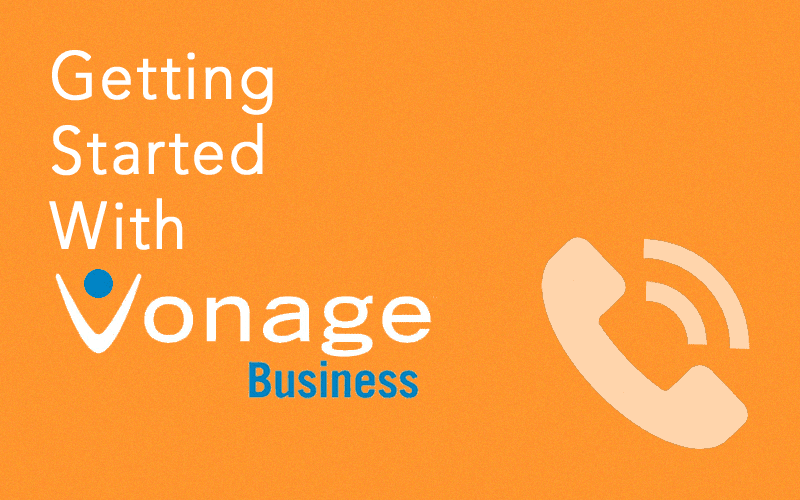 We wanted to put together a little run down of exactly what its like to get started with Vonage to help your business gain the absolute most out of your new VoIP phone service. Thankfully, Vonage does a great job of assisting new users when they first sign up for service. 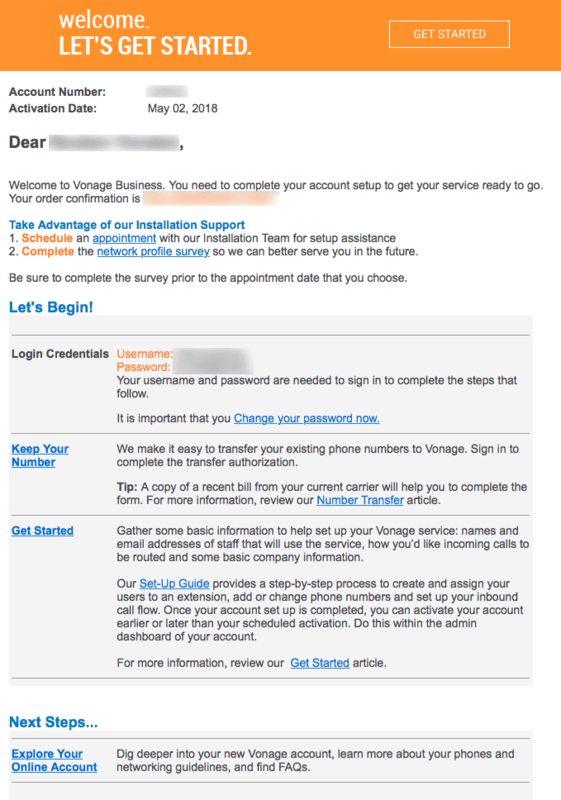 After subscribing to a service, and working closely with a sales representative, Vonage users will receive a Welcome email: this will be your first introduction to the Vonage system. This email provides some basic information, including your account name, temporary password, links to schedule an appointment for Installation and a Network Profile Survey, as well as a few quick steps on how to get started. Let’s break this down a bit further. Take a quick look at the Welcome email. Read over the information provided, and ensure that everything looks okay — your name, username, etc. This email briefly welcomes you as a new user, and provides you with three starting steps on how to begin with your new account. After you have verified your information, we can start with the emails first step: change your password. Right within the email, Vonage provides both your username and a temporary password, as well as a link to change this password. Simply click on the link and follow the on-screen instructions. Vonage does a great job of requiring users to utilize a complex password, helping ensure a higher level of account security. Many people are much too quick to reuse passwords, or settle on simple passwords that will leave your account susceptible to simple brute force attack attempts. When it comes to your business, especially your organization’s communications platform, you want to ensure all of your solutions and tools are well protected to prevent unauthorized eyes from gaining critical or confidential business information. Once your password is changed, you will now be directed to login. Upon logging in for the first time, users will be introduced to the Guided Setup. 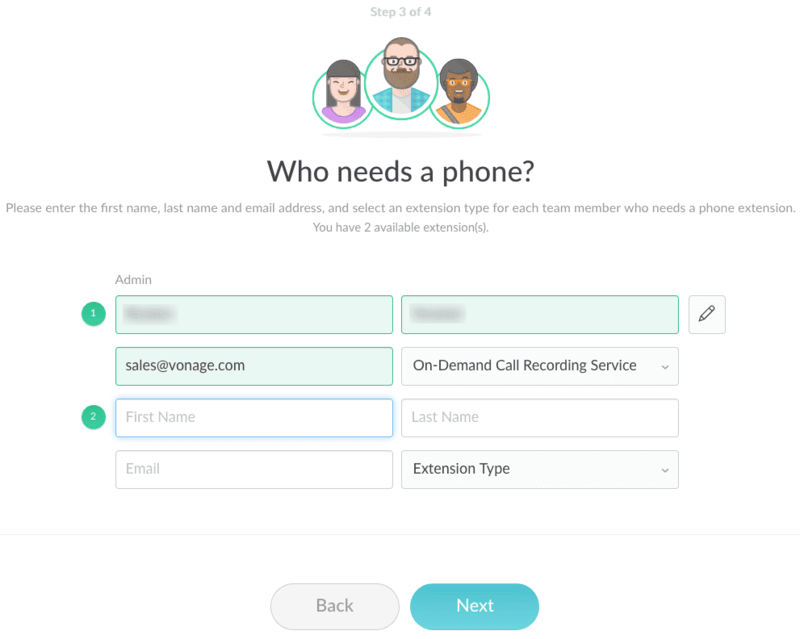 From here, you will be able to quickly configure your account by setting up phone numbers, extensions, and users. Now we will begin the guided setup. Vonage does a pretty great job here of helping users navigate through this setup process, but we’ll break it down even further. The first page you will see will contain a summary of your account. From here you will see a list of features that your account has access to, for example the amount of phone numbers associated with your account, the amount of extensions, and so on. This screen will also display your business’ address. If something doesn’t look right, before they continue setting everything up, users now have the opportunity to pause and contact support or sales to straighten everything out. This same screen also enables users to confirm or edit their address, just in case there was a change or an error was made when signing up. Simply click the next button to proceed if everything is correct. Upon verifying that your account information is correct, users will now be instructed to assign phone numbers to their new Vonage account. Right away this screen will state how many phone numbers your business has access too, depending on the service plan your business subscribes too. 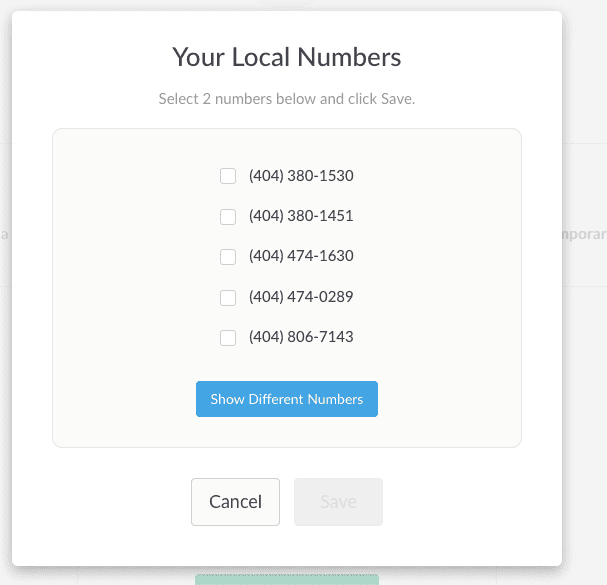 From a drop down menu, users are able to choose the State and Area code, but they cannot customize the numbers themselves. 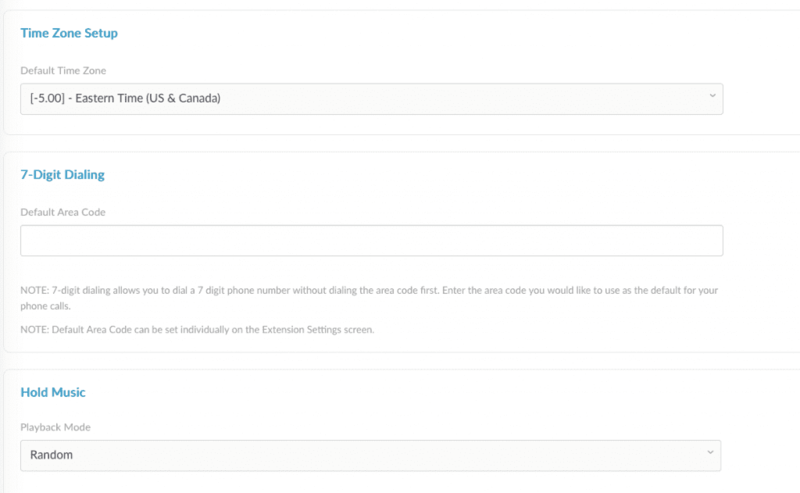 A list of phone numbers will then be generated, and users will have the option to select from a list of numbers. Users can simply click a button to generate more numbers if they don’t see any that they like. 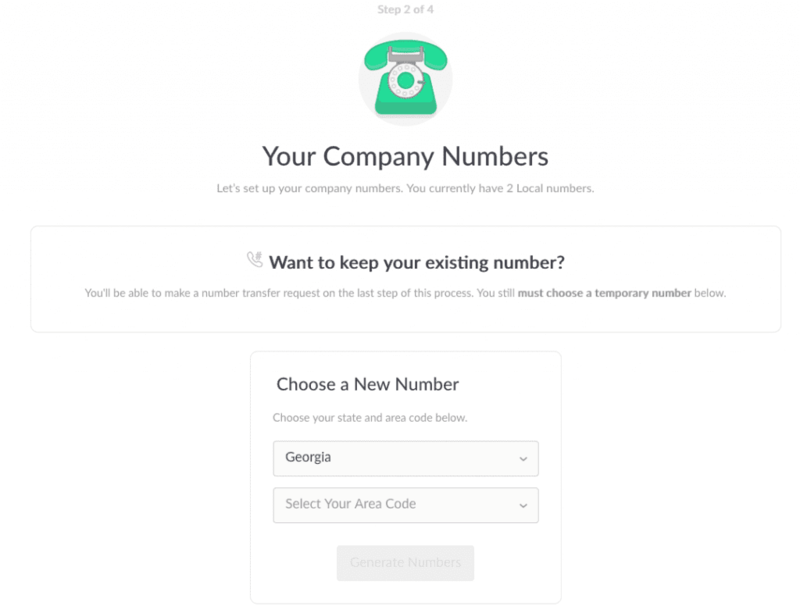 If your business is keeping a phone number, you will be provided with an option to do so later in the account configuration, but a temporary number must be chosen at this point. The next step of the process will now assign different phones to different users. Users will be prompted to enter the first name, last name and email address for the user, and then select the extension type for teach team member that requires their own extension. Hitting the next button will complete the process, and establish your account with Vonage. Users will then be directed to the Admin Dashboard, in which you can gain even more control over your account. And that’s all there is to it. If you follow the simple on screen menu and options, the process should take no more than 5 minutes or so. Vonage did a great job putting together a simple to use platform that guides users through the process, one step at a time. However, if you do not want to follow this guide, or simple need to make a change or view more detailed information, Vonage has also provided users with the online dashboard. But lets say you don’t want to run through the Setup Guide, and instead would like to configure everything on your own? Thankfully, that’s fairly easy as well. Once you finish the Setup Guide, or simply click the X to close out, users are then directed to their main Admin Dashboard. 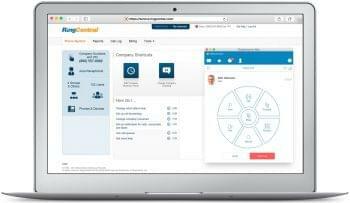 This dashboard is your central hub, from which you can control just about every single aspect and feature of your Vonage solution. Just glancing directly at the dashboard, we have quick access to Users, Extensions, Number porting, Account Activation and the Setup Guide. On the left side of the screen is where you will see the main navigation window, and from here users have even greater access to manage their service. Separated by Phone System, account, Store, Billing and Reports, the menu is broken down even further into individual sections. What’s really interesting is that if you click on a section, but your account does not have access to that feature, then you will receive a notice explaining what the feature is, what’s included, and the cost associated. 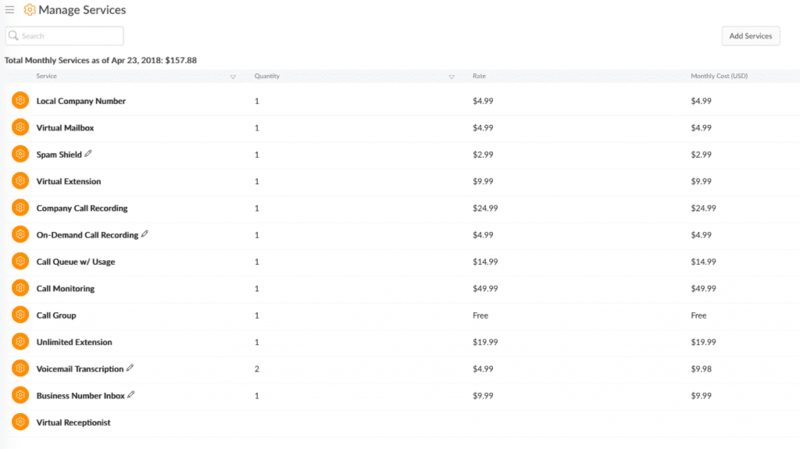 Users can they directly add the feature to their cart and order it right then and there if they wanted. But lets dig a bit deeper into the actual configuration. So right on the left panel, the first section you will see is “Phone System.” From here users have access to everything they setup during the Guided process, as well as even more features. For example, this Phone System section provides access to the main Admin Dashboard, Users, Extensions, Line Appearance, Phone Numbers, Virtual Receptionist, Conference Bridges, Call Groups, and more. Under users, you can edit or add new users, under extensions you can assign different extensions to the users you created, and number phone numbers you can manage all number associated to your account. To setup an extension, you will first need to setup a user. 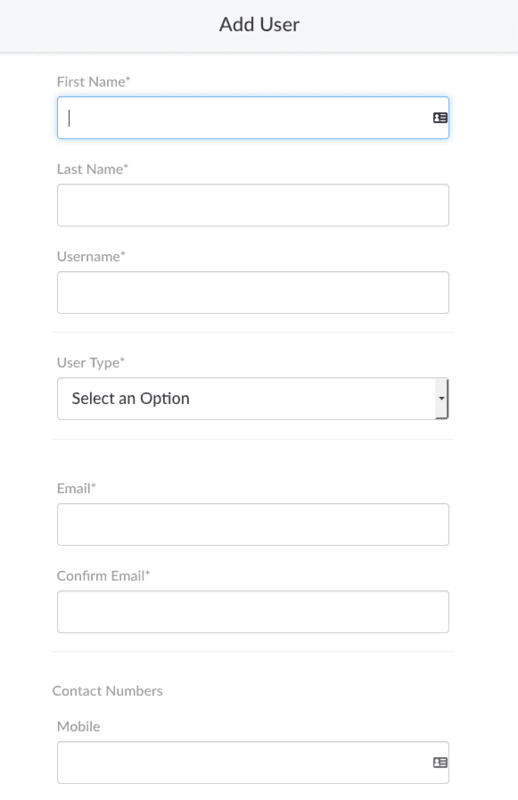 Clicking the Add User icon simply brings you to this page, where you fill out relevant information like the Name, Username, Email and additional contact information. Under Extensions, users can then manage their existing extensions, and assign users and numbers to each extension. The numbers associated with your account will be listed in the Phone Numbers section. 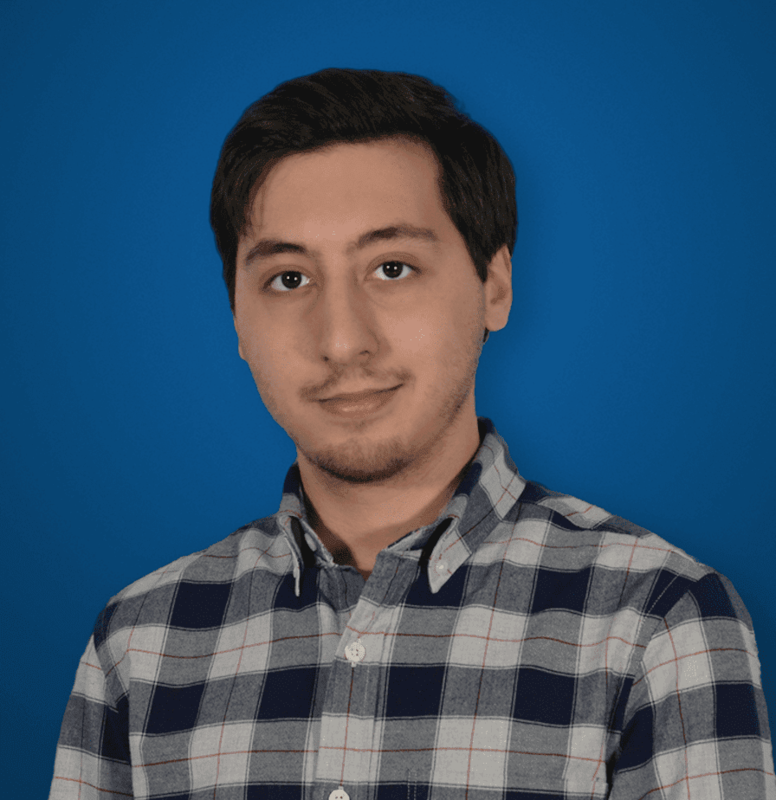 Overall, the same process applies for every section listed, which provides users with great control over their entire platform. For example, adding a Virtual Receptionist provides users with a simple 3 step guided process to get everything setup. Right under the Phone menu is another section dedicated specifically to your Account. From here you access your Customer Summary which contains information like Account Number, Account Name, Account Status, Contact Name and Account Creation/Activation date. Users also gain access to their Company Contact information, which can be edited. Here you can change your Company Country, Company Name, Address, and contact information. 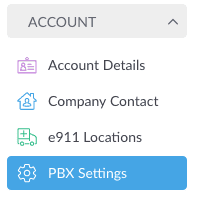 More importantly, this section provides users with access to their hosted PBX settings. From here you can change important settings including your Time Zone, a 7-digit dialing, Hold Music, and Outbound Caller ID Number. Moving out of the Account section and further down to Billing, and you gain more control over your critical account information. Under Billing you can see your Bill History, Current Payment Due, Billing Information, next Bill Date, Payment Information, and another section titled Manage Services. From here you can see every feature and function your business subscribes to, and exactly how much each function costs. And last but certainly not least, the final section of this menu provides users with access to their Reports. From here you can analyze and visualize different data sets that represent how your organization is using the service, something every business should be looking at. 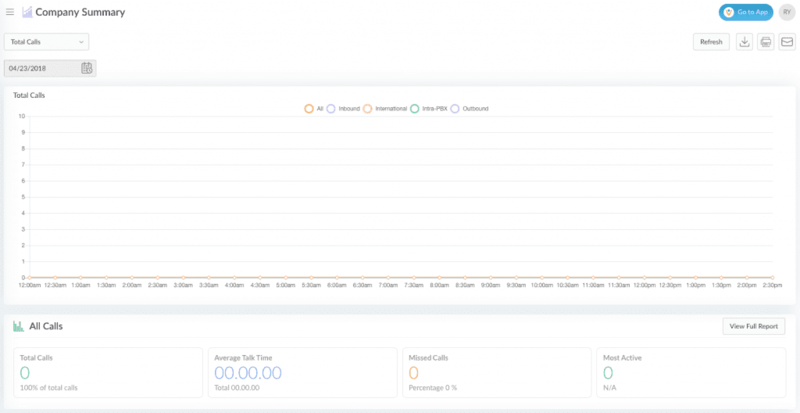 The first section includes an overall Company Summary, which enables users to visualize how many calls are made: inbound, outbound, international and Intra-PBX. You can also access Users, to see individual user data like how many calls they placed, and to what number the call was placed. There is also access to your Call Queues and Call Groups to monitor their status and usage as well. Overall, this section provides users with the ability to monitor their service usage, and analyze that data in a multitude of ways. 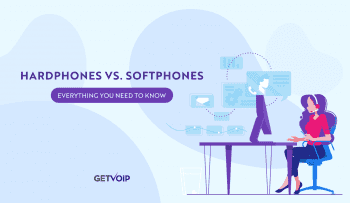 At the end of the day, transitioning your Business Communications to VoIP and UC is one of the easiest ways to cut costs, while providing your organization with an even more effective solution. UC enables teams to collaborate at a lightning quick pace, and provides users with the tools they need to always stay connected. 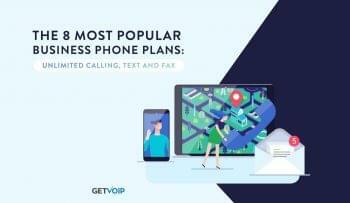 While the transition to Business VoIP can seem like a monumental task, providers like Vonage do a great job of guiding users through the entire process, and making everything as streamlined as possible. That’s why we want to highlight exactly what they’re doing, and even provide users with some information on how to go above and beyond. To learn more about Vonage, read user reviews here.